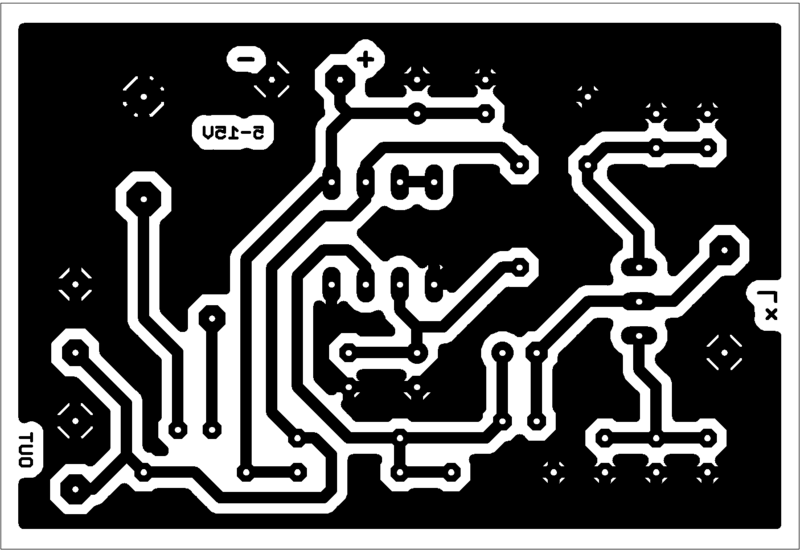 As mentioned above, the circuit was designed by an unknown author. I tried to optimise some part values with LTspice to increase the range of inductances for which the circuit oscillates, but didn't really succeed. .
where L is the inductance in Henry (H), C is the oscillator capacitance in Farad (F) and f is the oscillation frequency in Hertz (Hz). I've chosen the capacitors in the way they result in nice values when multiplied with 4π. This simplifies the calculation a little bit. The circuit is very tolerant to the supply voltage range. It works well with 5V. All I got was a simple 3-component of a series LC circuit. 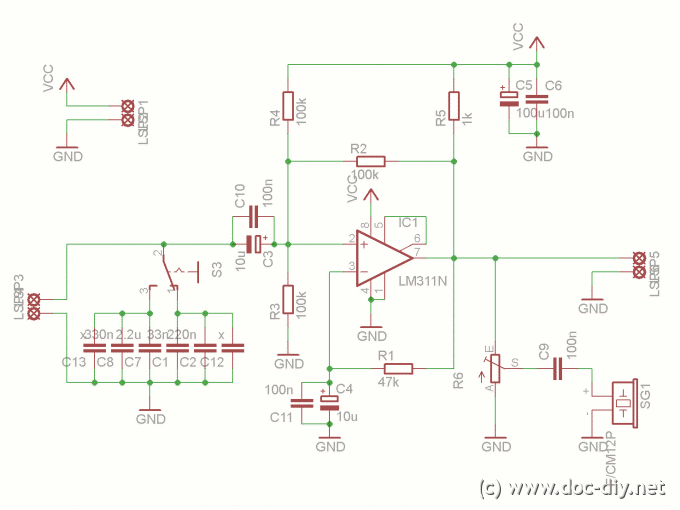 Could you please make the schematic shown in the figure? To be honest, I have no idea what the reason could be. My circuit oscillated with frequencies predicted with eagle, roughly (it's while ago). I guess the range of inductor values that oscillate is limited. The oscillator can also be sensitive to the comparator type and how the supply voltage is stabilised with capacitors. I just put one of these together tonight, and it appears NOT to oscillate at the frequency given by the resonance of the LC network. The inductor does affect the frequency, but not in any useful way. As another poster wrote below, this is just a relaxation oscillator (which seems to oscillate at about 1.5Hz in the absence of the LC network). 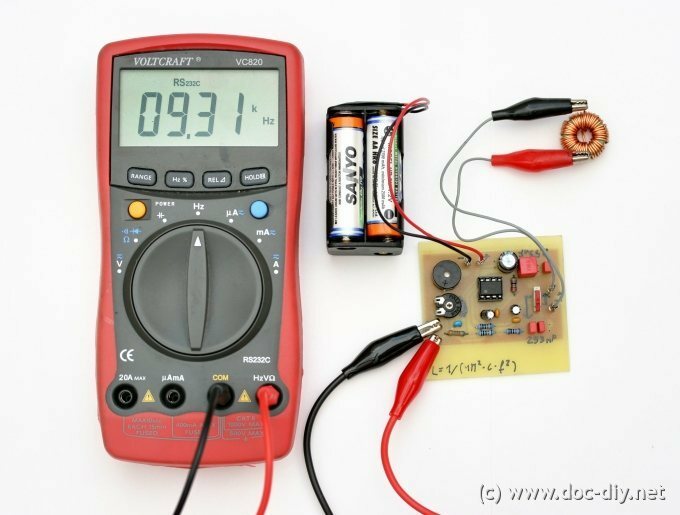 I think the author chose an lm311 as it is much faster than most common opamps and thuerefore suitable to build an oscillator that operates at frequencies above the audio range. Can u explain how is it actually following frequency of tank circuit instead of working as relaxation oscillator? please tell me what is the value of R6? I also want to know why the use of LM311, can it be replaced by an LM741? What is the name of this type of oscilator? Hello, looking the mathematical formula I have a question: making small changes this circuit could Capacimeter functions? 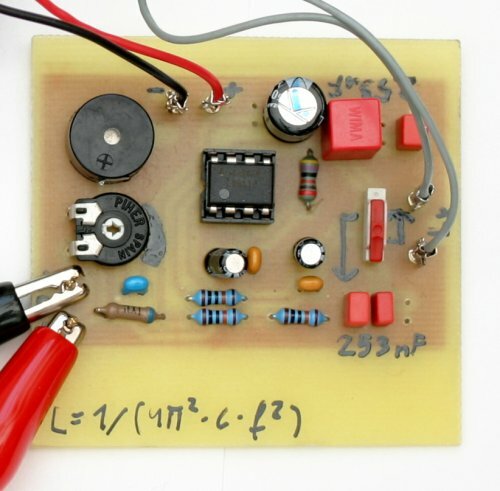 You could use it to automatically center the resonant frequency of a LC circuit connected to the base of a transistor without having to manually calculate the impact of the base diffusion capacitance for example. I wondered if someone can tell me why this circuit uses a comparator (LM311) as an oscillator instead of an op amp or something? Is it because op amps tend to have lower bandwidth, because a square wave output is desired or because it's easier to interface with an LC circuit or what? Just had a quick play with your LTSpice file. If your inductor really has a resistance of 0.2 Ohm the problem is the Q of the circuit. For the series LCR circuit in that file, the resonant freq is about 7117Hz but the Q is only 1.12 - not very selective. Q = 2*PI*Fo*L/R for the series LCR (or (1/R)*sqrt(L/C) ). If you reduce R you will see the peak in the amplitude of the current in the circuit get sharper and the slope of the phase trace get steeper (as Q increases). Reducing C also increases Q but Fo increases too. The other issue is the actual reactance of L & C at 7kHz If you modify the simulation to put L & C in parallel with a series resistance of 100k between them and the source that is closer to your real circuit. Then look at the voltage at the junction of R with L & C the voltage is tiny and that is probably the real reason for lack of oscillation. Just had a quick play with your LTSpice file. If your inductor really has a resistance of 0.2 Ohm the problem is the Q of the circuit. For the series LCR circuit in that file, the resonant freq is about 7117Hz but the Q is only 1.12 - not high enough for oscillation. Q = 2*PI*Fo*L/R for the series LCR (or (1/R)*sqrt(L/C) ). If you reduce R you will see the peak in the amplitude of the current in the circuit get sharper and the slope of the phase trace get steeper (as Q increases). Reducing C also increases Q but Fo increases too. I found tonight that my element(USI1614-12) only went up 1.2mH inductance from where I had it set from my computer aided method. I would say that using the inductance method a guy could get 90% or so of the sensitivity the unit is capable of. I was pretty amazed at how sensitive the inductance was to relatively small changes of armature positioning. I would say that this method would work best on elements that have their greatest sensitivity when centered.